The US just isn’t as dynamic as it used to be, and we need to start thinking hard about how that affects the economy. That’s the conclusion from Steven Davis and John Haltiwanger, two National Bureau of Economic Research economists (Davis is at U Chicago and Haltiwanger at the University of Maryland). The two presented at the Fed’s Jackson Hole conference over the summer and an updated version of the paper was published at the end of October. Declines in labour market fluidity — the ease with which workers can move between jobs — have continued since the 1980s. 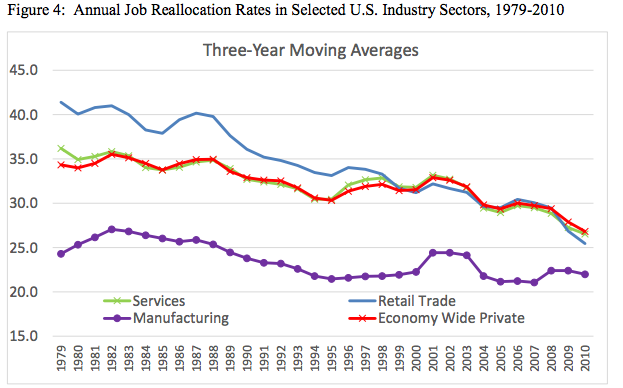 According to the authors, there’s been an unusually “large secular decline in the pace of job reallocation” during this period in the US. Reallocation is defined as which is the total jobs created plus total jobs destroyed, divided by total jobs in the economy. “A decline in these rates [job creation and destruction] could indicate less innovation or less labour market flexibility, both of which are likely to retard economic growth,” explains economist Mark Curtis at the Atlanta Fed’s macroblog regarding this paper. The big driver of this before 2000 was the retail sector, as big box stores came in and demolished smaller competitors (that actually turned out to be relatively good for retail wages). But you can really see in the above chart that there’s been a decline across sectors. And there is a school of thought that bigger companies mean less competition, which in turn pushes down wages (most recently floated by Justin Lahart in the WSJ). Regardless of firm size, declining fluidity in the labour market matters for a few reasons. If you believe that creative destruction is good for the economy, the declining number of small, young companies is a bad thing. But perhaps more pressingly, the researchers find that job reallocation rates have an impact on employment rates, particularly for the young and even more strongly for young men. Not only is it associated with lower unemployment rates, but it potentially negatively affects the length of time that the unemployed have to look for work, as fewer job changes likely means fewer job openings, and therefore fewer chances for those out of work to jump back in. “Employment today begets employment in the future,” write the authors. And fewer job openings mean fewer people moving between jobs in the same industry. Here’s how job churn over the last 15 years breaks down by gender. There are two notable things about the second half of this list: first, the authors point out that it’s impossible to know how much the policy-related factors “contributed to secular declines in fluidity.” While all of these are possible factors for the trend, no one is quite sure how much each factors in. Further, it’s important to note that some of these are policy protections meant to protect workers, and while they may reduce churn, they also protect people from getting fired because of discriminatory employers. 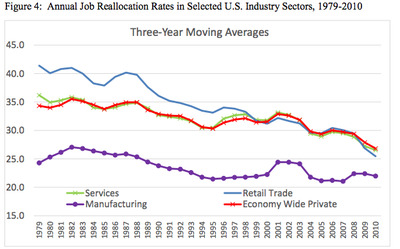 Even though there are some reasons why regulating fluidity could be good for workers, the long-term decline in reallocation is bad for the economy. That much you can tell from this paper. What you can’t tell is what are the main drivers of this problem, and how to fix it. That’s the challenge for economists and policy makers if they want to build a healthier economy.